There’s something strange about buying a perfume from the same people who manufacture your toilet bowl and bathroom sink. Imagine Kohler or American Standard coming out with a line of luxury perfumes in the United States — would anyone buy them? U.K. bath/kitchen fittings maker Czech & Speake has had great success with its home and personal fragrances, and today I’m reviewing three of Czech & Speake’s nine perfumes. Citrus Paradisi starts with intense grapefruit (smooth and rich) and spices (accent on the coriander); a ‘polite’ patchouli note and some sheer moss comprise the base notes. This is a pleasant, "warm" citrus cologne (and a great replacement for dime-a-dozen sport-type fragrances for men). Citrus Paradisi dries down to talc-y citrus and smells clean without bringing to mind “laundry room.” Citrus Paradisi’s grapefruit note does not become unpleasant on my skin (there is no sulphur, no urine de chat), and the fragrance has good lasting power (for a cologne). Citrus Paradisi is 'seasonless' — it can be worn year-round (it's not too lightweight for winter). No. 88 smells like an old-fashioned English-made lozenge Nancy Astor might have sucked on as she pondered her next public pronouncement on — women, men, politics, old age (“I refuse to admit that I am more than 52, even if that makes my children illegitimate”1). Like myself, Nancy was a native Virginian, and she felt that birthright put her on higher social footing than anyone in the world, past or present — Adam and Eve included. No. 88 begins with the scent of citrus oil infused with (rose) geranium leaf (Pelargonium graveolens) and sweet flowers (frangipani); there are hints of rose and menthol too. No. 88 smells rich, and the longer you wear it the more you detect roses — “rose” from the pelargonium and rose from rosa. If you love the delicious scent of rose geranium leaves, try this perfume. No. 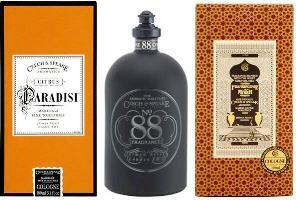 88 was Czech & Speake’s first fragrance and remains the company’s best-seller. Lasting power: very good. I wore Frankincense & Myrrh in college; it was one of my first “English perfumes.” I liked it then; I like it now. From the start, you smell sharp, vibrant frankincense and pungent cedar wood, followed by a lovely, almost powdery, myrrh note. Though it is not mentioned in the ingredients list, I smell a note very similar to “ashy” benzoin. The fragrance mellows over the hours but never becomes insipid or dull. If you liked Eau d’Italie Baume du Doge but found it too “spicy,” give Frankincense and Myrrh a try (both fragrances produce “buoyant” wood notes). This fragrance is wonderful from start to finish and has very good tenacity. If you live in the U.K. you can get 100 ml of Czech & Speake Eau de Cologne for £57 ($94 U.S.) — very reasonable. In the US, prices range from $115 to $185; at the moment, the cheaper prices can be found at Cambridge Chemists. For buying information, see the listing for Czech & Speake under Perfume Houses. Note: top right image is Grapefruit Splash by Steven Fernandez at flickr; some rights reserved. 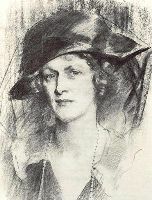 Second image is Image of Nancy Astor via Wikimedia Commons. Last image is Mosque Hassan II, Casablanca by amerune at flickr; some rights reserved. Thanks for the reviews, Kevin! Have you mentioned C&S’s very generous sample program? I’ve long been a fan of No. 88 and have a bottle. But I recently got samples of all their other frags and was impressed with nearly all of them, including both of the others reviewed in this post. Thanks for letting us know about the sample program. I can’t wait to get mine! I like the 88 bottle quite a lot, but it sounds like the Citrus Paradisi is going to be more my thing — I’ve been obsessed with grapefruit lately. Phinclio: generous…but inept! I requested samples ages ago and never received a one! My sense is that they were flooded by requests from American Basenoters. I wouldn’t be surprised if their operation became a little overwhelmed! I’m such a sample ho – I just ordered a bunch too! Love getting packages from overseas…. Ah…so I see it is Czech and Speake week at NST! I really like the F&M. I ordered samples from their website this morning, and was happy to see this review today. C: which samples did you request? 88, Cuba, F&M, and Dark Rose…sorry I didnt get the Citrus Paradisi. I remember an article about Ozzy Osbourne in which the interviewer said Ozzy was walking around in a cloud of No. 88 lol I’ll have to give that one a try. Czech & Speake week at NST! Kevin, all of these sound fantastic, but especially 88 and CitrusP. I must get some samples (the only C&S I’ve tried and own a decant of is Dark Rose). Could you compare CP to Balle de Match? I’m an absolute grapefruit fiend. Also, 88 sounds like a great geranium alternative to FM Geranium Pour Monsieur, which I need to sample a bit more, but which I disappointingly found lacking in complexity. Joe: it’s been awhile since I tried BdM…maybe someone with more recent “experience” with it will comment. G pour Monsieur was not about geranium to me…but I only sniffed it in the store…have not worn it yet. Funny: to me there was a minty edge, but all about *very* strong geranium accord. Just ordered a passel of C&S samples myself. Coincidentally, PST/Marina wrote about Cuba last week. Joe: not a fan of Cuba. Wha? There’s no lavender in F&M? What is that horrible monster doppleganger then that I get after a quick flash of incense? Is it the cedarwood? The basil? The combination? I am so confused. Does anyone else get Grandma’s drawer sachet of lavender? Maybe I should try ordering another sample. Hmmm. Anyway, as always, Kevin, lovely review(s). You really take your time to examine the fragrance, give us a chuckle or two and then include some inspiring imagery to match. Love that last mosaic pic! I tried most of the line, and they all came across as too masculine for me to wear (I’m a female). Citrus was quite ‘pissy’ (sorry to say), and 88 was all about the soap to me (like a freshly showered guy — not a bad thought, but not something I’d wear). F&M was the most wearable to me, but still quite on the masculine side. Kess: I agree about the masculine vibe…even Paradisi…but do think women can wear them all. Now, Dark Rose…tis a ladylike thing to me! That is marginally better than someone just saying “yo mama” I suppose! When I lived in Virginia the worst was missing church on Sunday….it wouldn’t take the Flowered Hat Brigade very long to round up a plate of cookies and be on your doorstep to “inquire after your absence”…..hmmmm….we were probably off cavorting with SATAN! can there be any other reason for missing Sunday service?? Rappleyea: I’m from the Tidewater area…it’s even worse there. “Did your people arrive in JAMESTOWN! ?” HAHA! While I was the proverbially hated yankee in their midst, my husband’s family were very early settlers in the Suffolk area, so they tolerated me! Krok: I can only imagine you run with the wrong crowd then! about C&S……if you sign up for their notices etc. they happily send you a sample of every fragrance…at least they did several months ago. With the exception of the 2 rose fragrances, the C&S line is really really really masculine on me. Too much so, and I usually like “shared” fragrances. Not unpleasant, mind you, just too guyish. Daisy: Apparently, I’m on their blacklist; I signed up for notices and requested my samples at sign-up…and have received nada. Maybe it’s actually your mail carrier blacklisting you. Or “protecting you from yourself”. HA. I’ve filled out the Frederic Malle questionnaire thing several times hoping they’d send me samples but they haven’t yet. Bond No. 9 is the same way. Stingy, stingy, stingy! I found all but Rose (boooooring) and Dark Rose (really nice, but pricey for the lasting power) very masculine. Having said that, I thought they all smelled really nice – especially No. 88, which made me all swoony. (Insert fluttering-eyelashes emoticon here.) I keep leaving the sample on my husband’s dresser, but will he try it on? Nooooooo, he’s sticking with the Acqua di Gio. ok, seriously, sign up again. Maybe it got lost somewhere. well hopefully they send some to me because I have to pay for them to ship lol but $6 CAD isn’t that bad. Don’t know where I’d find them around here… maybe Holt Renfrew? Bunny: the HR in Vancouver didn’t have them when I was there…and you certainly won’t be getting samples if they do! LOL! I suppose if Van. doesn’t have them Bloor st. doesn’t either… I’m at a loss to where they’d be otherwise so internet for me! I’m sure that my husband will be sure that I’ve gone certifable now – because I just ordered the sampler set. I haven’t used a credit card to buy stuff from overseas since the Great Amazon UK Fiasco of 1999, but my obsession must be fed. Of course, now I’ve read all of the comments and I’m worried that they’ll all be to masculine for me. I wear Dirty English on occasion – as well as Mitsouko and Jicky (I know, those two are actually feminines), so I’m hoping that these will be wearable. If not, I’ll add them to the pile of things to be swapped – if I ever get up the energy to actually initiate any swaps. Yay! Now I’m excited again – thanks! Hi Kevin – thanks for the focus on C&S this week. I’ve decided to take a break from sampling for a while, but these reviews have persuaded me to visit their store and try to pick-up some freebies soon!!! How does F&M compare to Andy Tauer’s Incense Extreme, ou tof interest? That’s quite heavy on the Frankincense and woods, and I love it! Blimunda: there is a similarity, but the Andy Tauer is STRONGER, and dare I say a tad “harsher” than F&M. But I like both fragrances…I’m not adverse to harsh in incense fragrances. As discussed on basenotes, C&S frags have gone through some serious reformulation – as so often, not for the better. Some of this may have to do with a change of manufacturers (formerly Forester in Milan, Italy, now a London firm), but not all. The rose note in No.88 has changed significantly from its former “gothic” intensity to a soapier feel, the strong pure frankincense not IN F&M has given way to more conventional woody notes. Dark Rose used to be very distinctive and now smells like one of the lighter (to me, less interesting) Montsales (e.g. Damascus). I do not know vintage versions of the others, though the current Néroli seems to me to be compromised by a synthetic off-note. It’s still a very good line, but it used to be better. The Good Life: I noticed a change in intensity with No. 88…but it’s character is still “intact” to me. F&M is very similar to how I remember it AGES, and I mean AGES, ago. I’m with you on the Neroli and Dark Rose though. A few months ago I received samples of everything C&S from them, very nicely packaged, a real treat. I don’t know if it’s me or them (or both), but every single one of their scents has, for me, an off note in it, something very “fake” smelling, and seemingly the same thing, though I haven’t enough knowledge to tell you what it is.I remember thinking they should stick to bathroom fixtures, which are very nice. Frankincense & Myrrh is wonderful, not unlike Grossmith’s Phul-Nana. When I win the lottery I shall bathe in C&S Frankincense & Myrrh lol! I want to get the Room Spray for my house at Christmastime. I agree with “the good life” that 88 is not what it once was, to its tragic detriment. Proust notwithstanding, you can’t trust what you remember “from ages ago”, sir. With all due respect: Test the old and new side by side! I feel there can be no discussion of F&M without speaking of lavender of which there’s a generous dollup, to be sure! The “vintage” version isn’t all that different from the more recently available product. too bad 88 has been reformulated – ruined! you’d be hard pressed to find any rose whatsoever, aside from in the printed literature accompanying the bottle. a tragedy! 88 has become a band without a stone, a frame without a picture. a joke, in short, and not a good one! how can you miss the lavender in F&M? there is tons!